Your favorite summer snack has some serious health perks. camera (Getty Images) Your favorite summer snack has some serious health perks. intro: No other produce screams summer quite like watermelon. It could be its refreshing sweetness or even the burst of color that adds a bit of brightness to your plate. Thing is, there's more to watermelon than just its flavor: It boasts some powerful health benefits, too. At 46 calories per cup, watermelon offers 20 percent of your daily intake of vitamin C and 17 percent vitamin A, according to the USDA. That's not all. No wonder there's a month-long holiday dedicated to it—July is National Watermelon Month. Here are some other fun facts to celebrate watermelon's big month. quicklist: 1 category: What to Know About Watermelon title: It has more lycopene than raw tomatoes url: text: In just one cup, watermelon has 1.5 times the stuff than a large fresh tomato, 6 milligrams compared to 4 milligrams, according to the USDA. That matters because lycopene is thought to act as a super antioxidant, stopping free radicals from damaging your cells and messing with your immune system. Some research even suggests that lycopene, typically found in red fruits and vegetables, may help fight heart disease and several types of cancer. "To retain the most antioxidants in this delicious superfood, store your watermelon at room temperature before slicing," Sass says. quicklist: 2 category: What to Know About Watermelon title: The juice can relieve muscle soreness url: text: A Spanish study in the Journal of Agricultural and Food Chemistry found that drinking watermelon juice can actually be quite soothing after a grueling workout. Athletes who consumed a little more than 16 ounces an hour before exercise had less muscle soreness and a lower heart rate within a day. quicklist: 3 category: What to Know About Watermelon title: It's a fruit AND a vegetable url: text: Talk about an overachiever. 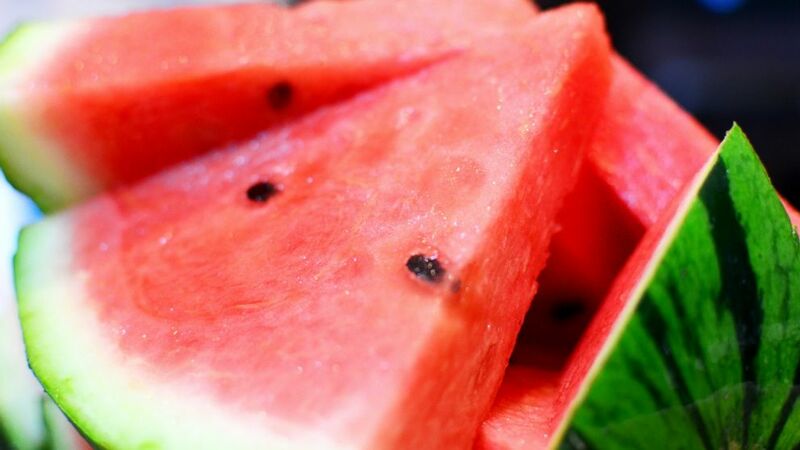 Like most fruits, watermelon is the product of a seed-producing plant and has a signature sweet taste. But it can be traced back to the squash, pumpkin, and cucumber family known as Cucurbitaceae. Remember how you can eat the rind? The dual nature of watermelon makes it all edible, so there's no excuse to leave any part behind. quicklist: 4 category: What to Know About Watermelon title: It's packed with, well, water url: text: Now this is a food with some serious hydration power. Watermelon is 91.5 percent water, according to the USDA. That's a big deal seeing as how being dehydrated is bad for your health. A study published in The Journal of Nutrition found that women with even mild dehydration experienced headaches, poor concentration, fatigue, and worse moods. quicklist: 5 category: What to Know About Watermelon title: There's a yellow variety url: text: It's hard to believe there's a watermelon that's NOT pink on the inside, but there's another variety, known as Yellow Crimson, has a sunny interior and the flesh has a sweeter, honey-like taste. Thing is, the two are nearly identical on the outside, so unless you're reading the signs at your grocery store or farmers' market, it can be hard to tell which is which. If you want the regular pink watermelon, ask for a Crimson Sweet.